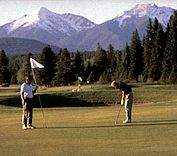 Nestled in the heart of the Rockies, the Meadows Golf Course at Double Arrow Ranch is one of the premiere golf courses in Montana. The spectacular course is a true golfer’s paradise, and is carved among gentle rolling hills and towering ponderosa pines. While taking on 18 holes, golfers also take in breathtaking views of the Swan Mountains to the east and the Mission Mountains to the west. Built in 1994 with an expansion in 2001, the holes were designed by architect/golf pro Edward L. Bezanson and the Meadows is a par 72 championship course. Each hole of this amazing course offers three sets of tees to accommodate golfers of all ability levels, and Number 15 is noted as the signature hole - featuring an elevated tee and island green. Throughout the 6500 Yard layout, you’ll find a sparkling creek, abundant wildlife, numerous water features (found on 11 holes), and bunkers. If you want to see for yourself, you can even take a virtual online tour! Golf season opens April 1 and closes October 15. For pricing and more information, visit the Double Arrow Resort’s website.